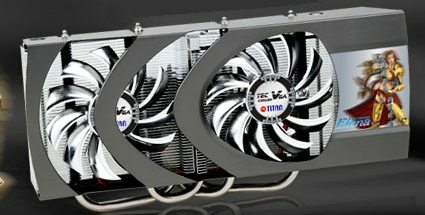 Titan has released a new high-end graphics card cooler, the Elena TEC VGA Cooler. It's compatible with ATI's current X1950, x1900, x1800, x1600 and x1300 series. It supports the GeForce 7950GT, 7900, 7800, 7600 and 6800. The GeForce 8800 nor ATI's upcoming Radeon R600 aren't supported. By monitoring the VGA temperature, this control system is able to automatically switch ON/OFF power to maintain the temperature in a certain range, that is, if the GPU is too hot, the TEC (Thermal Electric Cooler) will start cooling; on the other hand, if the GPU is cool enough, the TEC will stop cooling. Thus, there is no condensation problem like old TEC solutions. In addition to the TEC cooling, the Elena TEC VGA Cooler is equipped with two 80x80x10mm fans and four copper heatpipes that help speed up heat dissipation. While cooling down your GPU, you will be also pleased with its silent operation. If it can't handle 8800's then the TEC is too wimpy.